Explore the Farms in Wilton! Bee Fields Farm is a small family farm on Abbot Hill with thirteen acres of woods, wetlands and farmland, including a healing plant garden with over 100 medicinal herbs. The herbal shop includes herbal teas, salves and creams, infused oils, herbal infused honey, and a wide variety of gifts. Bee Fields products are available at various retail locations and on their website, and they also welcome visitors to the farm - just call ahead to make sure they are home. Hungry Bear Farm is a small veteran-owned and operated farm with locations in Mason and Wilton NH. We specialize in growing a wide variety of some of the area's finest produce using regenerative agricultural practices like cover cropping, manuring, composting, crop rotation and reduced tillage. We do not use any GMO seeds or synthetic chemicals. Ledge Top Farm in Wilton is proud to offer Certified Naturally Grown fruits and vegetables to local communities. Certified Naturally Grown is a grassroots alternative to certified organic that is designed for family-sized farms as opposed to agribusiness. Come and sample our fresh produce during the summer months at our farm stands in Wilton and Amherst or at the weekly farmers’ markets in Milford, Merrimack, and Bedford. Quarry View Farm is a small, family-run farm providing farm fresh produce and farm products. They offer animals (chickens, ducks, goats, quail), meat, eggs, flowers and plants, produce and home décor items. For more information or to place orders, contact them at [email protected] or message them on Facebook. The Temple-Wilton Community Farm was formed during the winter of 1985/1986 and is the oldest continuously operating CSA in the United States. 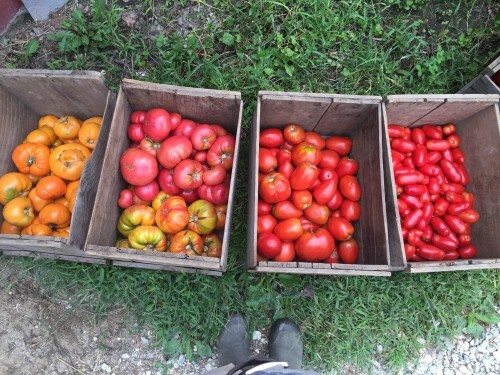 The farm produces a full range of vegetables for its CSA members, including many storage vegetables that take members through the winter and into the following spring. The farm also provides milk, yogurt, cheese, eggs and meat for its members and sells the surplus to the public along with other items in the farm store.